A simple 3-LED analog music visualizer - accepts a stereo input such as from a computer or MP3 player. You might have seen a project I did a while ago - an Arduino based microcontroller musical lighting system which made 6 bright LEDs dance to music. Check out the project page here. That project was quite successful, but it used a microcontroller! In this project, I investigate how to make a nice little music visualizer similar to my digital one, but this time using only simple components (op-amps and passives). The goal - to drive 3 bright LEDs, and make them dance to music! This page outlines the design process and construction of this little project. Creating a music visualizer is a simple task. Our goal is to separate our input music source into separate frequency bands. Then, depending on the amplitude of each band, we light up an LED correspondingly. Thus on a deep bass note, the low frequency band shows a high amplitude, lighting up the corresponding LED brightly, while the mid and high bands have a low amplitude and their LEDs do not light up. The trick lies in creating a suitable filter for the different frequency bands, and then using this information to control the brightness of some LEDs. In this project, I have opted to create a visualizer with 3 bands - bass, midtones and high frequency, each lighting up a bright Red, Green and Blue LED respectively. The goal of the project is to create a simple circuit to do this using on Op-amps and passives (resistors, capacitors), and with a + - GND 12V power supply. From our input music source, we seek to create a high-pass, low-pass and band-pass filter. A simple low-pass filter would be an inductor, and like-wise a capacitor for a high pass filter. However, simply using these devices leads to a poor frequency response. An ideal cut-off filter should allow frequencies above/below the cut-off frequency to pass/block through - but this is challenging to create in a simple device! It is important to make a good filter otherwise we will have poor contrast in our dancing LEDs. Enter the active filter. Active filters have a much better response compared to a passive filter (like a simple RL or RC circuit), and therefore are more suitable for making nice contrasty LED lights. The topology I have decided to use is a Sallen Key filter, due to its simplicity and effectiveness as a second order filter. Above shows a generic Sallen Key topology with its associated gain from wikipedia. The article describes the system a lot better than I can so I shall not repeat what is being said. Suffice to say, the filter can easily be created by adjusting the Z component values (R or L), creating a suitable high-pass or low-pass filter. Two of them can be chained together to then create the bandpass filter. All that remains is to design the suitable Sallen-key filter. Here's an example. For the low-pass filter with a cut-off frequency f_c of 100Hz, I can choose the Z components to be 16K resistors and 100nF capacitors. This gives me an actual f_c of 99.47Hz with a Q of 0.5 and a response of around -40dB/decade! As you can see in the frequency response graph, V_out is attenuated significantly as the V_in frequency increases from 100Hz. The same process was then applied to create the high-pass filter, and the two filters in series for the bandpass filter. Above are two charts from the LED's datasheet that I will be using. Notice high the current drawn by the LED increases significantly within a small 0.4V window. It will be very challenging to adjust the brightness of the LED in this small range, from our musical source. Instead, a better idea is to use current to adjust the LED brightness! Notice how the relative luminous flux increases more or less linearly with current. We can exploit this by modulating the current sent to the LED using our musical source. Enter the transistor. 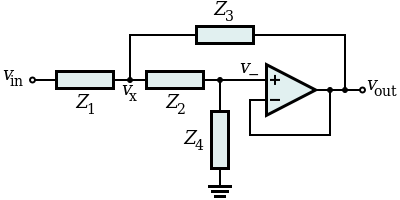 As we know, the standard BJT is a current amplifier when driven in linear mode, and the DC current gain is given by h_FE in the datasheet. I decided to use the standard 2N3904 NPN BJT, which has a varying gain of 70 to 100 at I_c from 1 to 10mA. It's somewhat unusual but we can use this fact as a current modulator to drive our LEDs! Now we have all the parts present to build our visualizer. 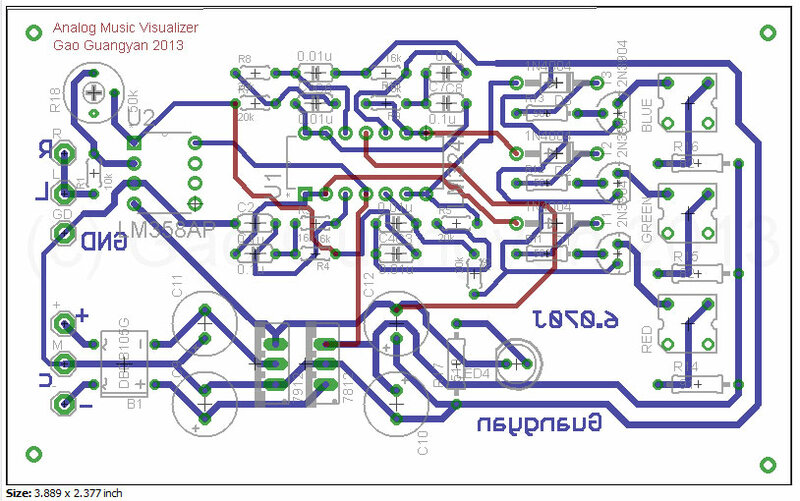 Below shows the complete schematic of my simple 3-band music visualizer. Lets see how it works. Our input (R, L, GND) comes from a stereo female jack. We connect R and L channels together since we don't really care about that. The output is an AC wave aound +- 0.4V or so, depending on your musical device. I decided that it should be good to include some sort of volume control, so the first Op-Amp acts as an adjustable gain of about 1 to 6. This amplified AC musical signal is then sent into the V_ins of the 3 filters. Notice I used a single quad-op-amp chip for the 3 filters (the band pass requires two). The filtered signals get rectified, and are fed to the base of the transistors. The base resistors limit how much current flows. This is amplified by h_FE which modulates the current flowing through the LEDs. The 91/82 Ohm resistors act as a max current limit. Finally, another yellow LED serves as a power indicator, and a 7812/7912 pair acts as regulators for the + - 12V rails for the circuit. With the circuit designed, I layed out the board and etched it. I couldn't get everything to fit onto one side so there are some wires which will needed to be soldered in place (didn't do a double sided etch). Note that there is a mistake in the labeling of the + and - input (they should be reversed). The inputs can accept a center-tapped transformer, or a DC power source with + - and ground. After etching and assembly of the components. The circuit is done! But will it work? I plugged it into a computer and did a wave sweep from 20Hz to 2kHz - everything worked out as expected, with a nice sharp transition between the frequencies! Above is a video of the circuit in action playing to the tune of Back Street Boys. 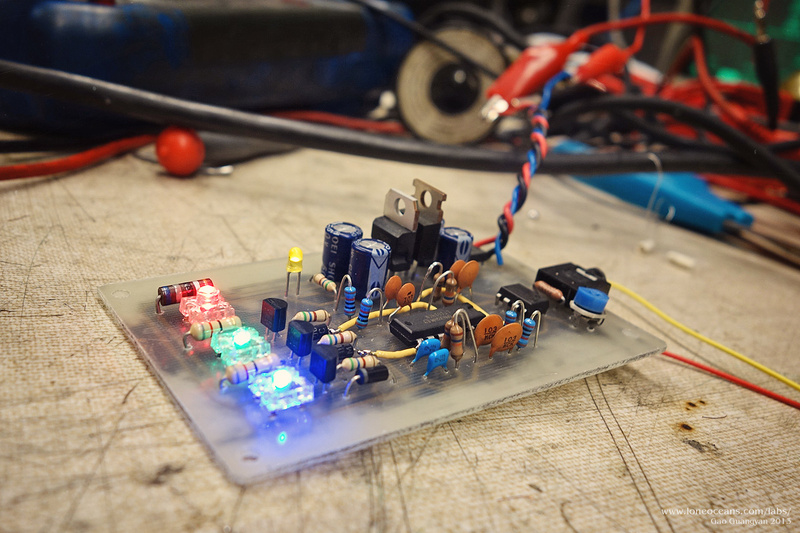 This project was done as part of a introductory electronics lab class with great instruction from Dr. James Bales.